Hmmm, how does the Vectrex driver manage the overlays per game? It seems like SVG_SCREEN would work for this, we just need the SVG renderer to cache the image instead of re-parsing it each frame. but that might have been changed? I wanted to see if I could get the Apple Graphics Tablet to return values up to +9999, but the firmware doesn't actually allow that, topping out at 0xa00. 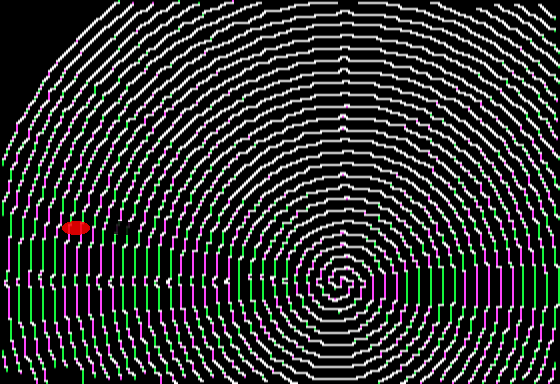 A little basic program with scale set to 1, "S1" in the initialization string.
' 90 PR#2:PRINT"D,M1" : REM DEFAULT, MIXED MODE PAGE 1\n'..
'     120 VTAB 22:PRINT X$Y$Z$\n'.. The values seem to be multiplied by 3, so 0xd05 * 3 = 9999. If you reset the driver with Shift+F3, your rom patching disappears. The PORT_ADJUSTER looked very promising but it was limited to 0 to 100. 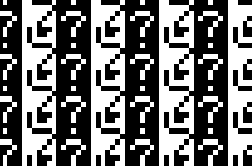 What if I did a define of my own that had a mask of 0xffff for 16 bits? 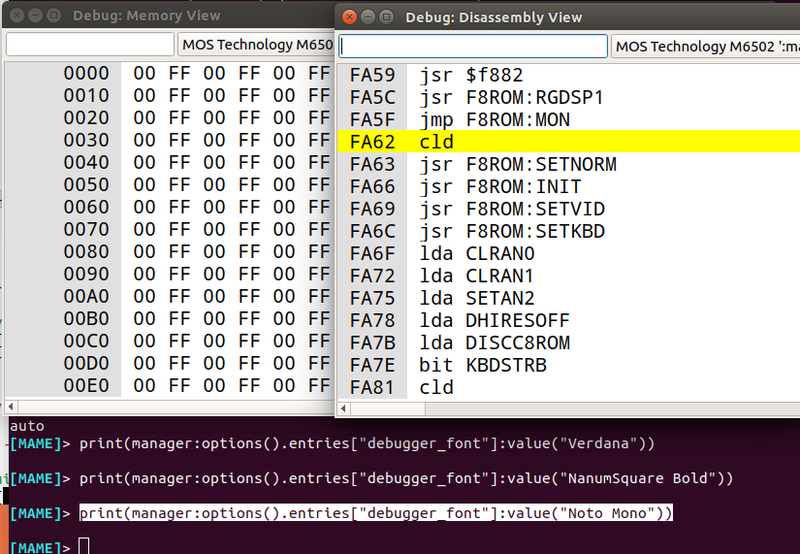 If I make my own PORT_ADJUSTER_16MASK macro based on the PORT_ADJUSTER macro in src/emu/ioport.h and change the mask, I can get 16 bits. It seems to work but it says percent in the display. So now I have an adjuster that goes from 97 to 2559 and I can hit ALT+LEFT or ALT+RIGHT arrow to go to each end of the full extent and CTRL+ARROWS to change the value faster. Last edited by Golden Child; 04/18/19 12:04 AM. I typed in a short little applesoft program but didn't load DOS, so how to save it? Just create a cassette image with the file manager with a .wav suffix (it won't work otherwise), then go to tape control, record and type SAVE and return from the command line. After it beeps twice, your program is saved. Make sure you're recording before you type SAVE or you'll miss some of the program. To load your program, type LOAD and return then rewind and play your tape image. The wav file gets large, like 4MB to save a 4K file, but it works! Once you reboot and load DOS 3.3, just LOAD from your cassette image. 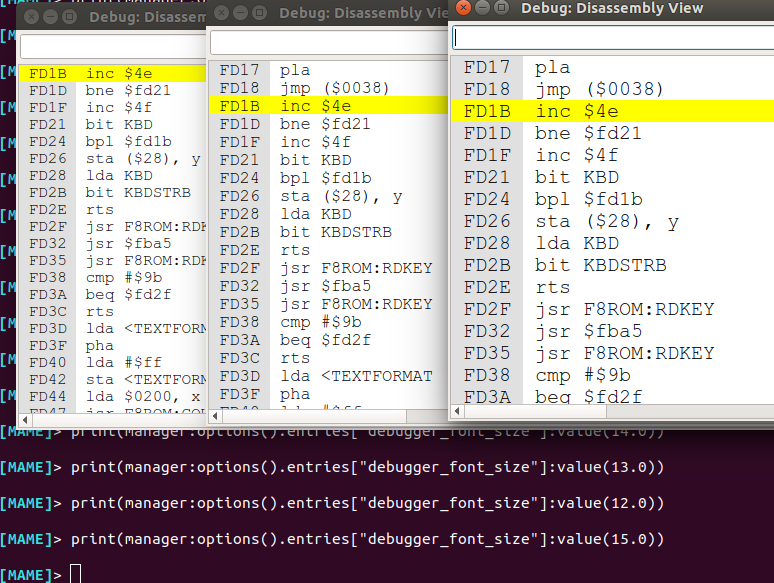 So you want to see bigger fonts in the debugger? change the option from the lua console. You won't see it unless you open a new dasm or memory window. Why not change the font too? Last edited by Golden Child; 04/18/19 01:25 PM. I tried to make a layout file and struggled mightily. If you want to see mame segfault, just put a stray < somewhere inside the layout file. That was fun to figure out. I took a layout file from the snspell artwork at Mr. Do's and could not get the buttons to work. 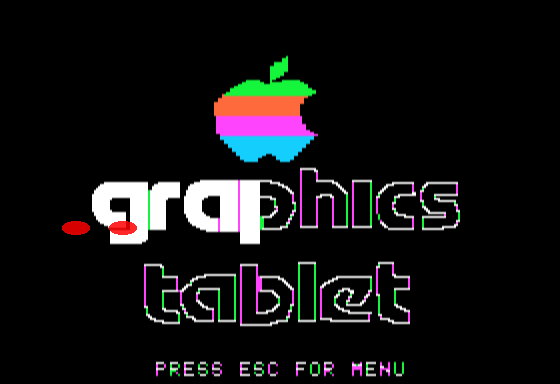 I tried and tried and tried, I put the flag MACHINE_CLICKABLE_ARTWORK in apple2p.cpp which didn't help. I could see the buttons but they didn't work. I thought I was going to go insane! So I noticed none of the buttons (clickable; move up/down when you press them) in this artwork file (mslug2) worked anymore. I look, and the neogeo driver was updated some time back. I look some more, and I see that the controllers for neogeo are now bus devices. > changed to edge:joy:JOY1 and edge:joy:JOY2. These tags appear in the -listxml output. Ah... knew it would be something simple. I had simply changed them to JOY1 and JOY2. That will help me with other thing, too. 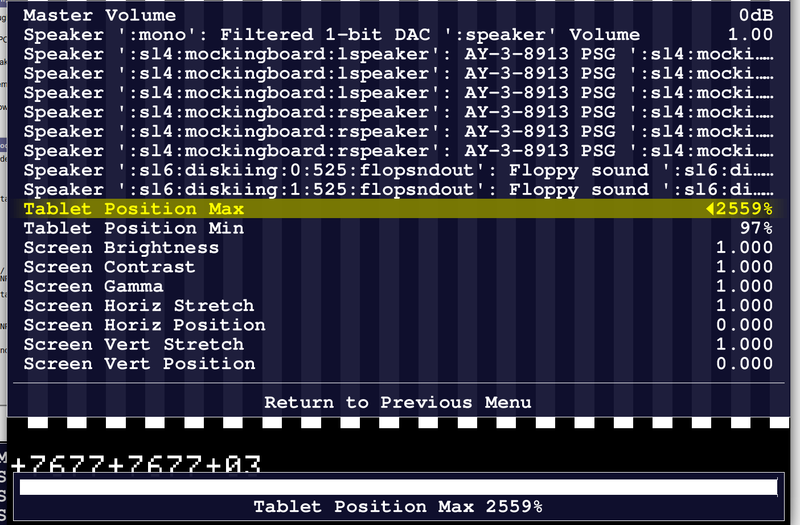 So after changing INPUTTAG="joystick_3_buttons" to INPUTTAG="sl2:agraphtablet:joystick_3_buttons" they started working!!! Last edited by Golden Child; 04/20/19 05:01 AM. 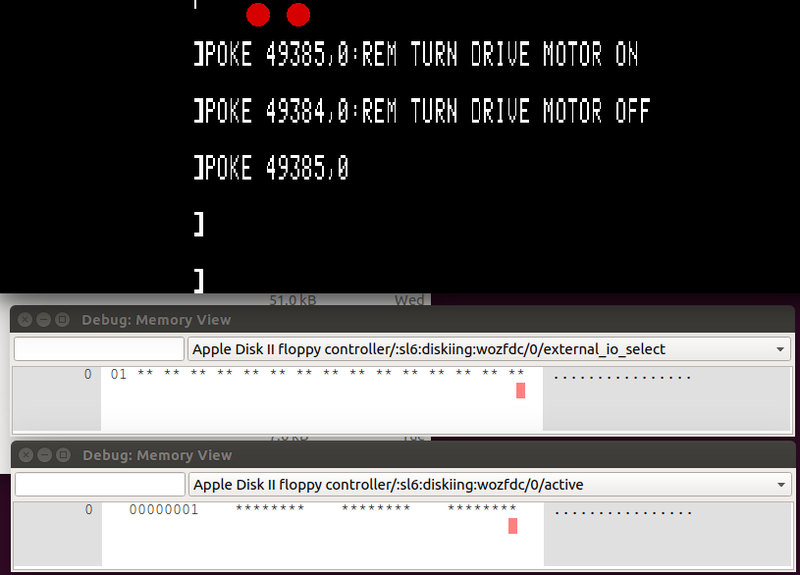 Has anyone made an apple II layout that shows the disk drive LED status? It should be theoretically possible to do a track LED display too like those indus GT drives.